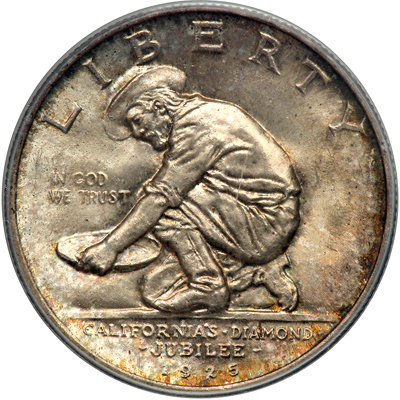 The 1925 California Jubilee Half Dollar was struck in commemoration of the state’s 75th anniversary. 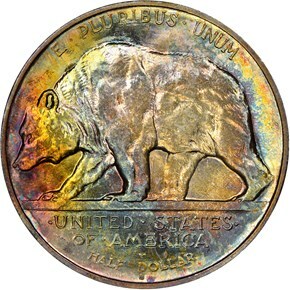 The San Francisco Citizen’s Advisory committee, headed by future mayor Angelo J. Rossi, was the organization which spearheaded the push for the production of the coin. At the time, commemoratives were already beginning to become a sore point for Mint officials. 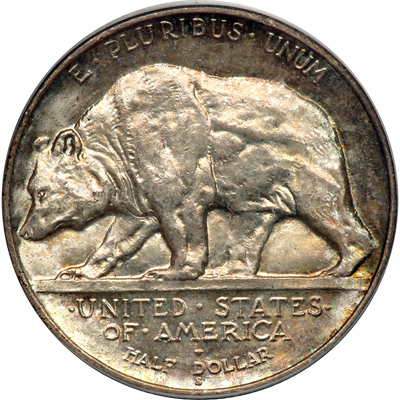 In fact, the coin might not have even been made at all had it not been for President Calvin Coolidge personally endorsing two separate commemoratives for Vermont. The California Jubilee Commemorative was slipped into the bill for those two coins, which passed on February 24, 1925. The committee then set to work finding a designer for the coin. 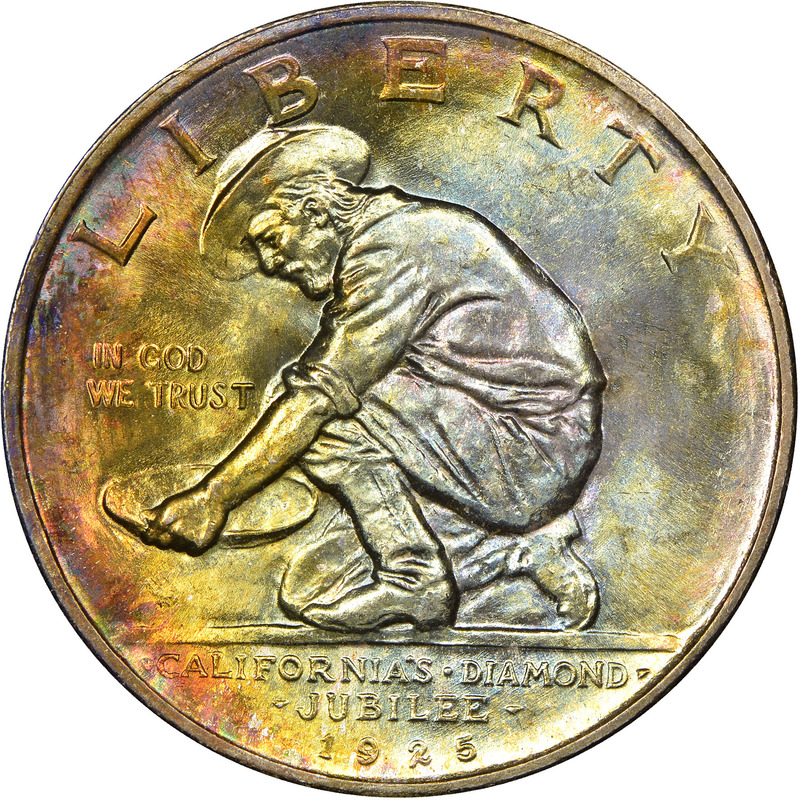 They eventually asked local well-renowned sculptor Jo Mora to design a coin that would help capture the spirit of the state’s Diamond Jubilee. 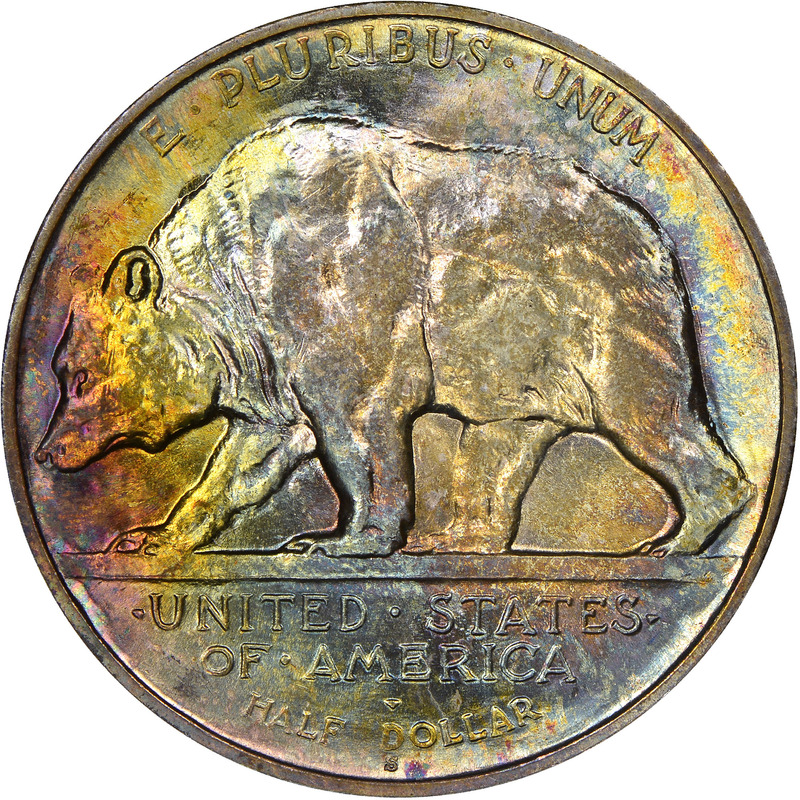 He employed two symbolic motifs: a Gold Rush prospector for the obverse and a grizzly bear on the reverse. An interesting touch that Mora made was to ensure that the fields of the coin remained unpolished, leaving the boldly textured surface just as it was on the sculptor’s model. The Congressional act authorizing the coin specified a maximum mintage of 300,000 pieces. Yet only 150,000 coins were actually struck and released. In the end, 63,606 pieces remained unsold, and were eventually melted, leaving a net mintage of 86,394. It remains a very popular issue to this day.